Ready to teach Big History? Whether you’re teaching the course for the first time or you’ve got a year or two under your belt, we hope this new training for teachers will have something for you. Today, we’re proud to announce Teaching Big History. This online course, designed to help teachers prepare to teach BHP, covers the big ideas of BHP, the instructional practices, the program details, and the BHP Teacher Community. We worked with our BHP teachers and the University of Michigan to develop the scripts and articles for the course so that it reflects the latest thinking about teaching social studies and has a strong classroom focus. We’re hoping this course will give you a running start to the year. Click here to get started with Teaching Big History. The Big History Project consists of eight thresholds and ten units, which make up the core narrative of the course. We’ve heard from many experienced teachers that getting this story down is an important first step in the course. Based on the public version of the course, Teaching BHP will walk you through each threshold as well as selected videos and readings to help you understand the central narrative of the course. Teaching Big History takes you through the key assumptions that shape our approach to reading, writing, and inquiry, assumptions that inform all the activities and lessons. For example, BHP has an approach to teaching reading called three close reads. This approach encourages students to read each article multiple times, looking first at the gist, then at the facts of the article, and finally reading the article for conceptual level connections to the driving question of the unit. This approach is woven into all of the lesson content and consistently deployed across the course. You aren’t required to use this method—or any method—in your teaching practice. If you have an approach that’s working for you or that is more appropriate for your students, we encourage you to keep using it. However, we’ve heard from many of our teachers that the BHP approaches have proven incredibly helpful. 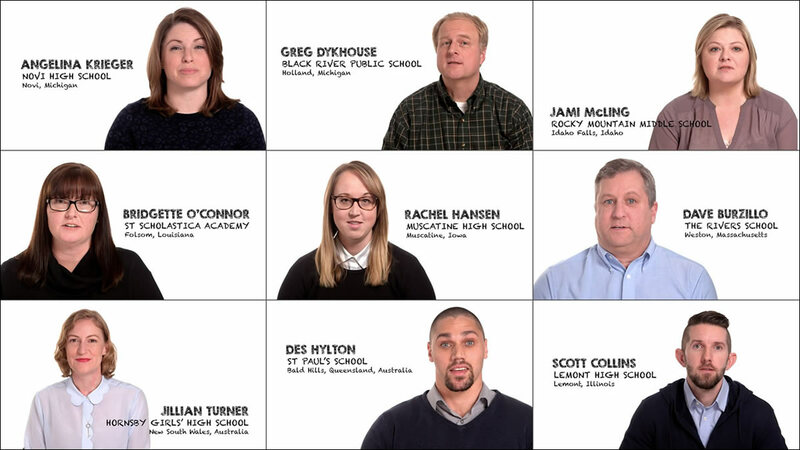 We asked our veteran BHP teachers to help us identify the most important questions and issues across the course. Together with the University of Michigan, we created a series of videos working from scripts drafted by those teachers. Then, we asked our teachers to write short pieces, called Teacher Takes, which explain how these issues play out in their classrooms. 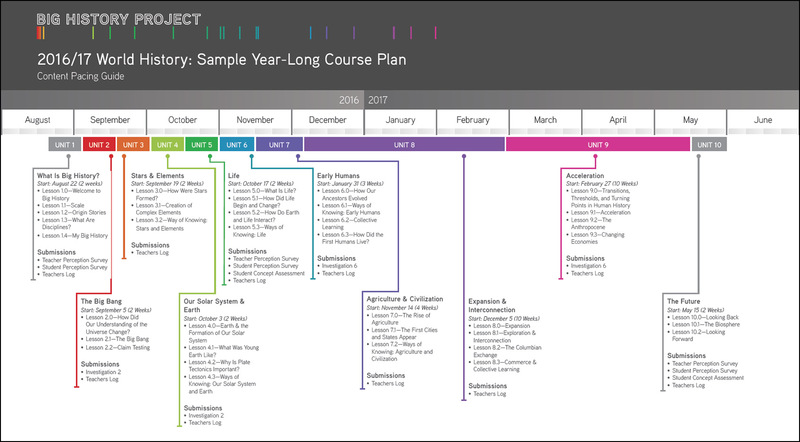 Teaching Big History is designed to help you get a handle on topics like setting up a course, planning the year, and getting help. There are a lot of materials and a lot of resources available, and Teaching Big History will help you to get your arms around all of them so they’re not overwhelming. One of the most important resources of BHP is the online teacher community. Teachers rely on this community to find answers to questions, get inspiration, or just compare notes with peers. To help you get used to using this online resource, we’ve created a series of exercises and woven them into Teaching Big History. The first invites teachers new to BHP to introduce themselves to their peers. Then, for each unit of the course, we invite teachers to talk about a video, reading, or activity they’re interested in using in their class. We will have a group of experienced teachers ready to discuss their experience at each step along the way. These discussions are important, as this is how most teachers get help as they progress through the year of teaching the Big History Project course. Teaching BHP is just the start of your teaching experience. Everyone completing the course will be sent a certificate for 9½ hours of continuing education, which they can share with their district. But even after you’ve finished the training, we expect you’ll want to keep reading. So, to help you along the way, everyone who completes the course will be sent a $25 Amazon gift card. And to help you use that gift card, we asked current BHP teachers to list their favorite BHP-related books, which you can find here. Do I have to be a current teacher to participate in the BHP teacher training course? I want to register as a teacher to-be as I am pursuing my teacher certification. I just feel like navigating BHP while getting my certification in Social Studies and World Geo would benefit me greatly! Please excuse the belated response. You are more than welcome to sign up as a teacher on the BHP website and peruse whatever materials you’d like. Good luck with your teacher certification! I am not sure that I have the correct department. I have for the last week and 3 telephones calls tried to obtain information for our employees having SAP numbers? No replies to my telephone queries. No one department that your Receptions can put me through. This is very frustrating. . Surely someone in BHP can supply the information? Would this work in a corrections setting? No access to the internet for inmates, but would like to learn more about this course and see how it could benefit incarcerated males trying to obtain GED or Commonwealth diploma. Pardon the delay here. Yes – BHP is used in many corrections settings. You can download most of the resources for offline use. Handouts and articles are all available for print. 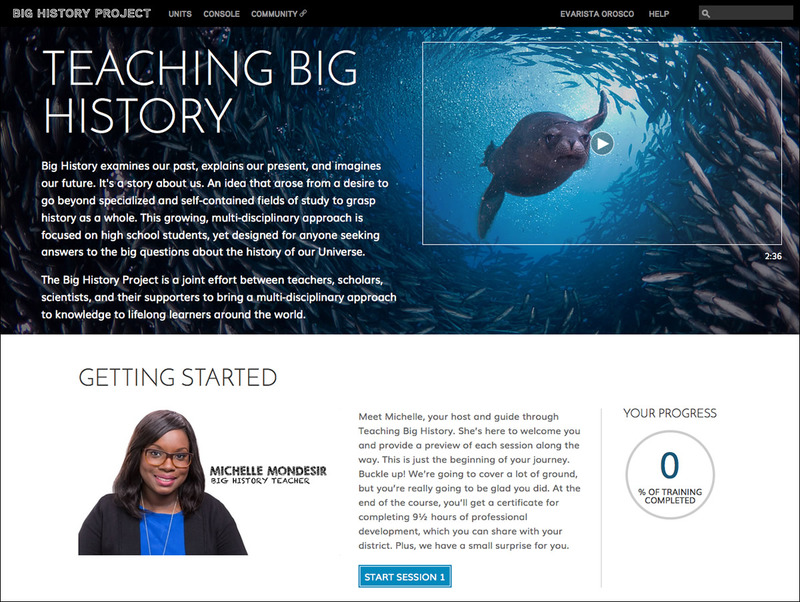 Please email team@bighistoryproject.com for more info!